How can a summer bounty of fresh herbs enhance your winter cooking? 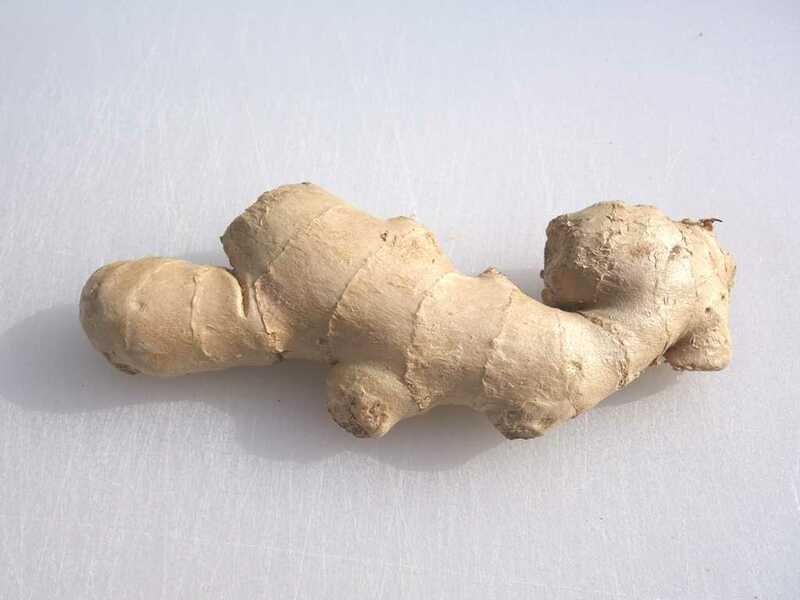 How can you save time and money by having ginger or garlic ready for that quick dish? The answer to both is freezing. 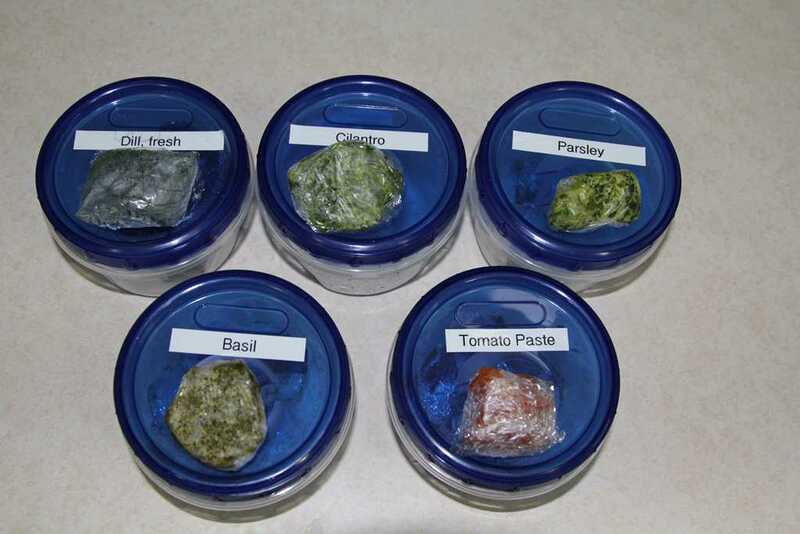 Following is an excellent method to keep frozen herbs and spices fresh and flavor packed for cooking any time of year. For more information on growing herbs, see our Kemper Factsheet: Herbs. Many herbs and spices can be frozen for later use. Among those that freeze well--if prepared as suggested in this visual guide--are ginger, garlic, leafy herbs (basil, chives, cilantro, dill, parsley, rosemary, tarragon, etc.) and even canned ingredients like tomato paste. Clean the herbs and spices and dry thoroughly. 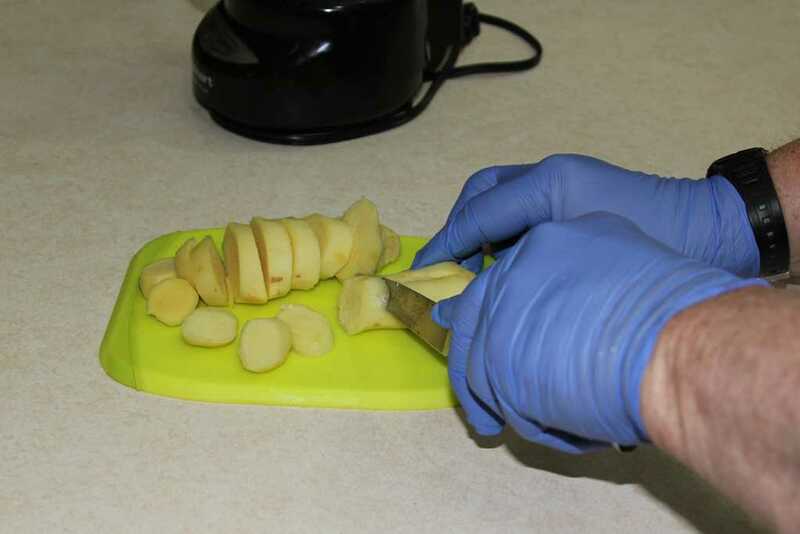 Drying is extremely important to reduce freezer burn (see more information below in the section on freezer burn). Peel if appropriate. 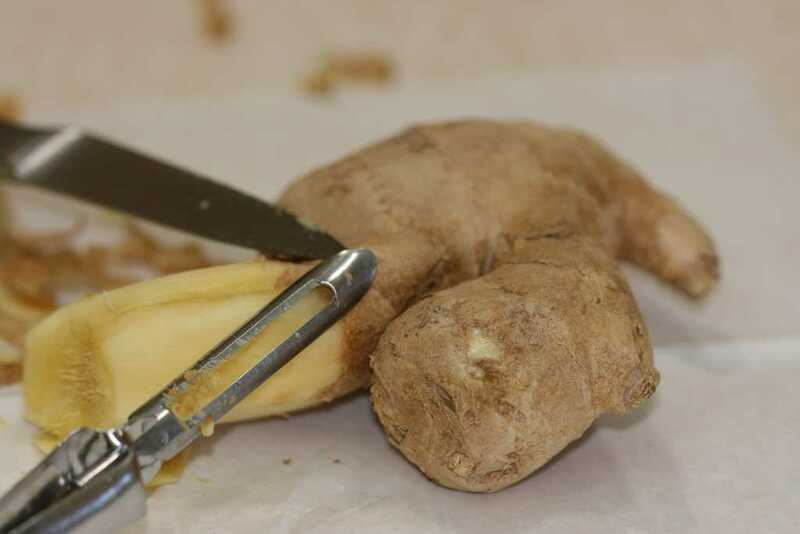 The image shows ginger root being peeled, although some people use it peel and all. 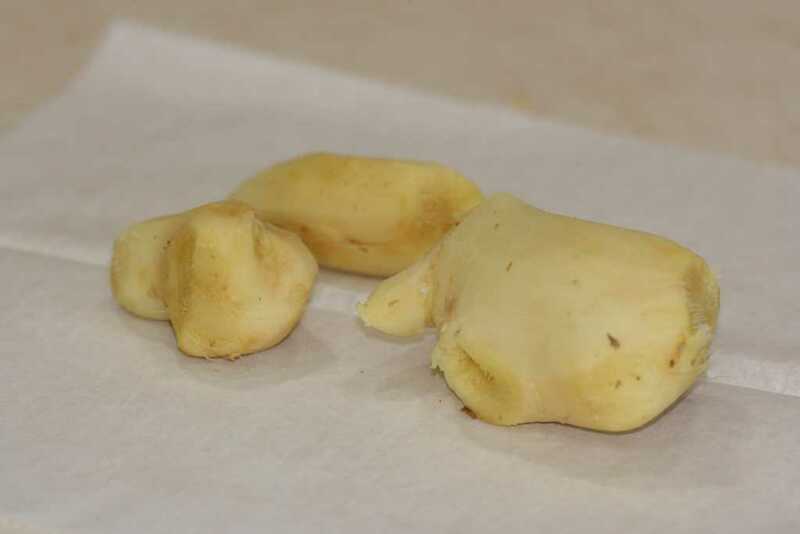 For garlic, remove the paper coverings. leafy herbs, discard larger stems or any unwanted parts of the plant. 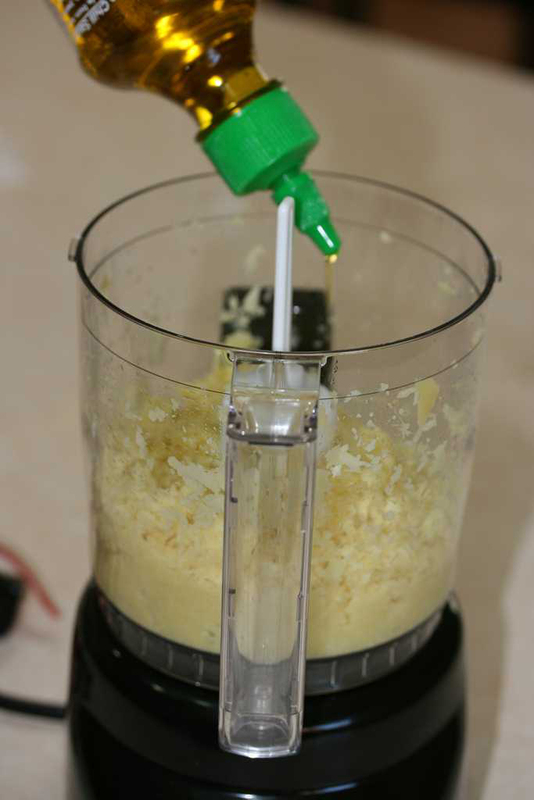 Cut roots or leaves into roughly equal-sized pieces to make it easier to chop or grind evenly in the food processor. 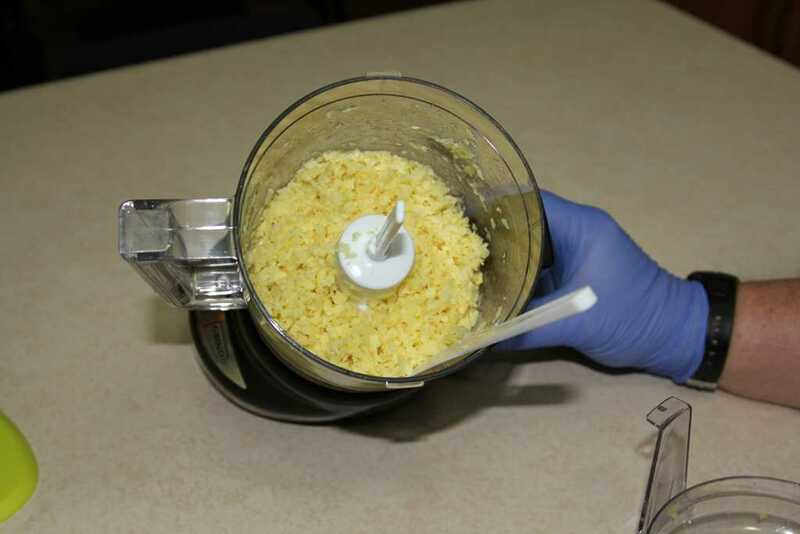 Chop or grind A food processor makes chopping, and especially grinding, easier. But this step can certainly be done by hand. The size of the pieces depends on how the herbs are to be used later. Add just enough oil, such as, olive oil, to make the chopped pieces stick together. The oil serves two purposes. First, it makes it easier to form and measure the mass of chopped herbs into serving sized nuggets. Second, it reduces the surface area within the chopped mass that is exposed to air. Reducing air exposure helps prevent discoloration of leafy herbs, such as, basil, and also reduces freezer burn (see, section on freezer burn below). Nature wants everything to be in equilibrium including the moisture inside your freezer. To attain equilibrium, water molecules on the surface of the frozen product (herbs in this case) go directly from ice to a gas in the dry air. This is called sublimation. The water molecules then reform into ice on the sides of the container. The result is that the product is in effect slowly freeze-dried. In the picture at the left, the moisture that was once inside the now-desiccated chives has been deposited as ice crystals on the side of the freezer container (the first surface it reached.) To solve this problem, eliminate as much air in and around frozen food as is feasible. 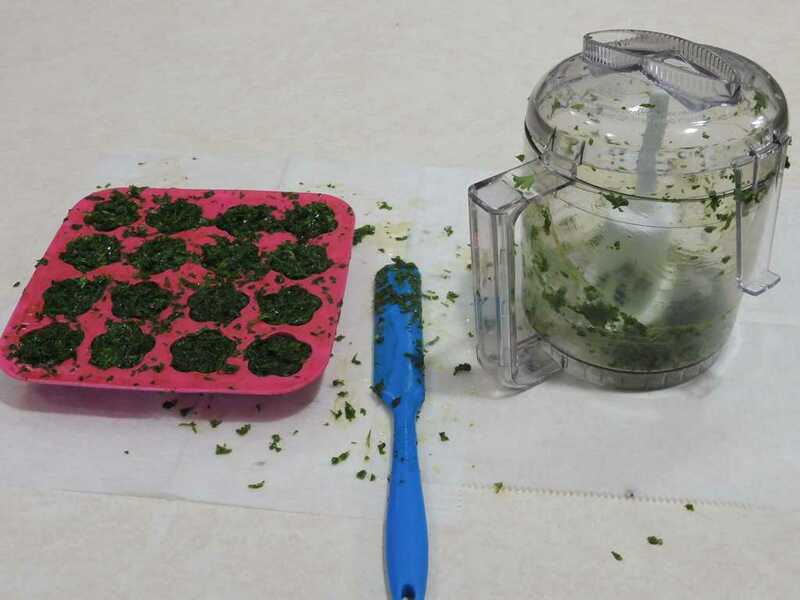 That is the reason for wrapping the frozen herbs in plastic wrap or vacuum sealing. Serving size depends on how much of an herb or spice will be used at a time. 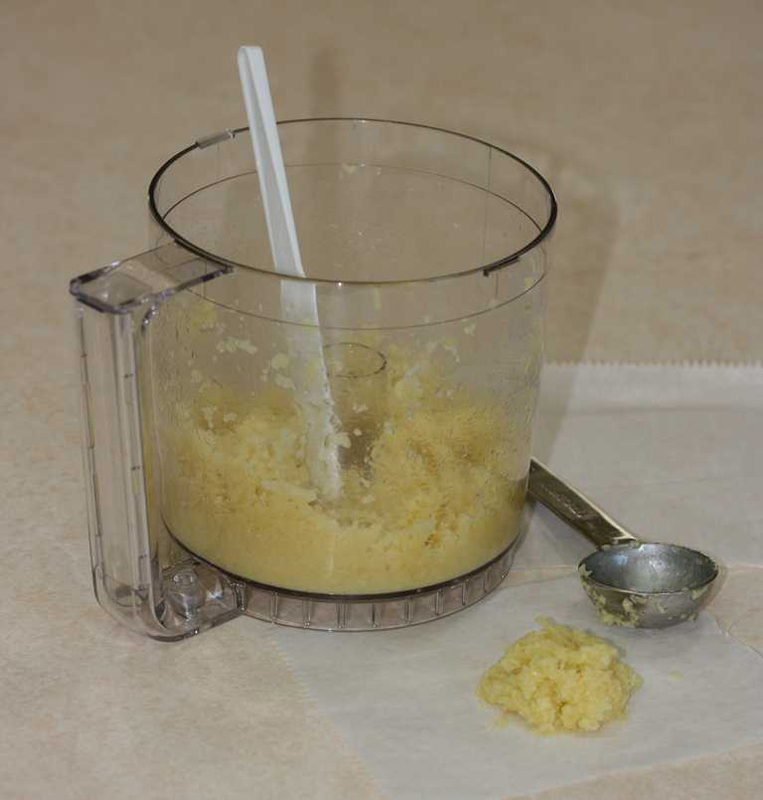 If a tablespoon is usually needed, use a tablespoon measure. 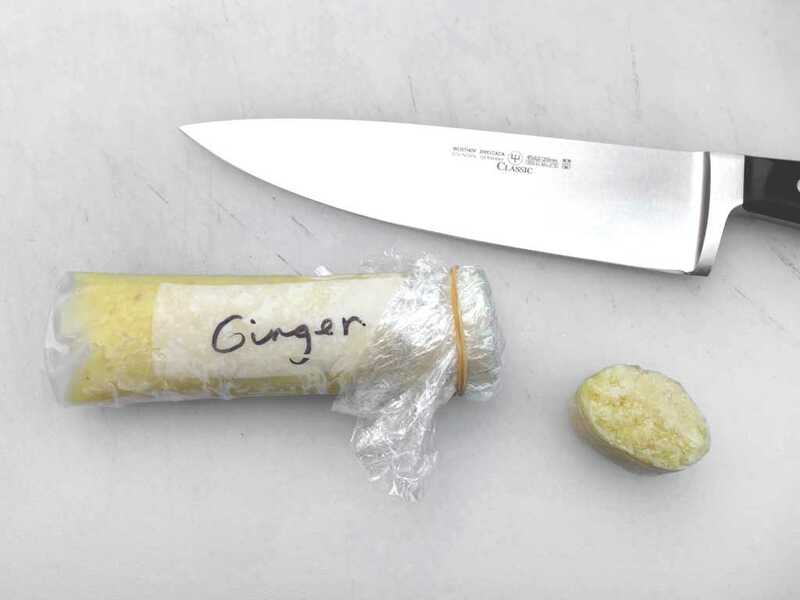 In the top image, a tablespoon measure was used to spoon out the ground ginger and oil mixture. 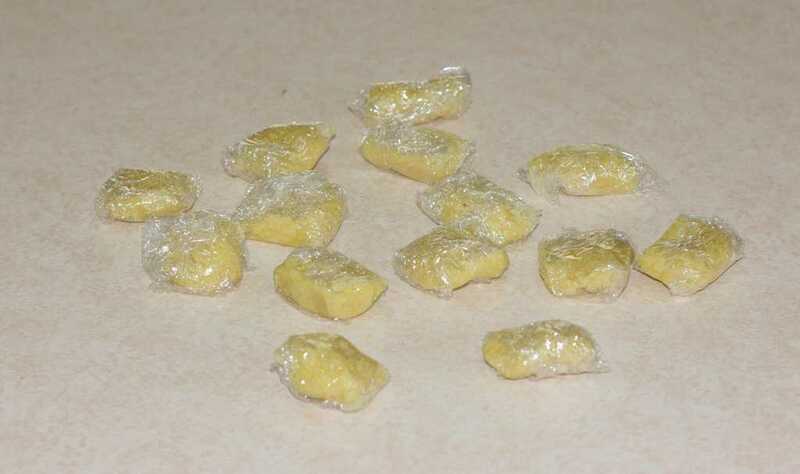 Ice cube trays can also be used to form useable-sized chunks. Pliable, silicon trays are especially easy to work with. The bottom image shows a miniature ice cube tray filled with ground parsley mixed with oil. 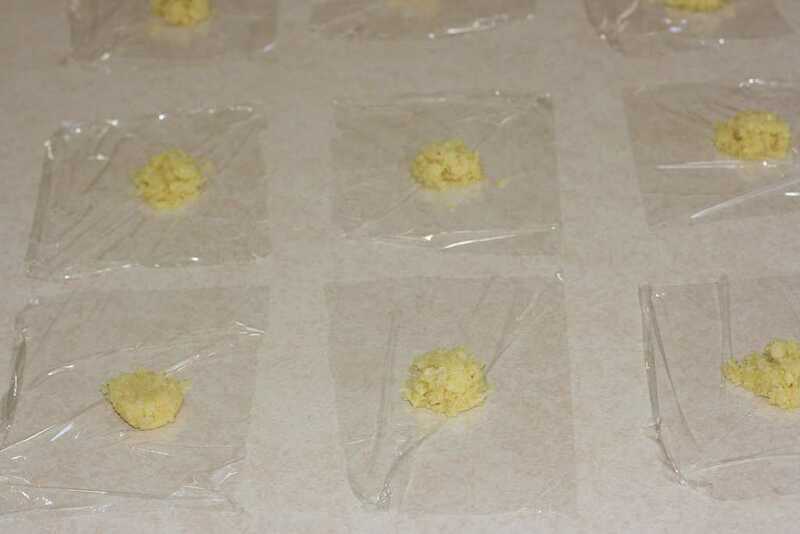 Press the mixture firmly into the tray, then cover the entire tray with wax paper or plastic wrap and place in the freezer. When solid, unmold and go to the next step. 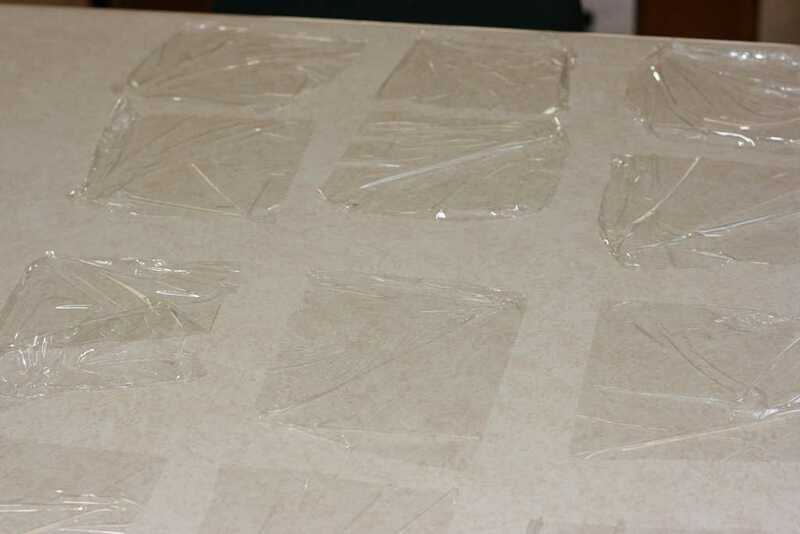 Cut up squares of plastic wrap for wrapping the prepared herbs. Waxed paper can also be used but it is not as effective at eliminating air pockets. As explained in the section on freezer burn, air is the enemy in the freezer. Much of it can be eliminated by wrapping the individual servings of prepared herbs in plastic wrap. 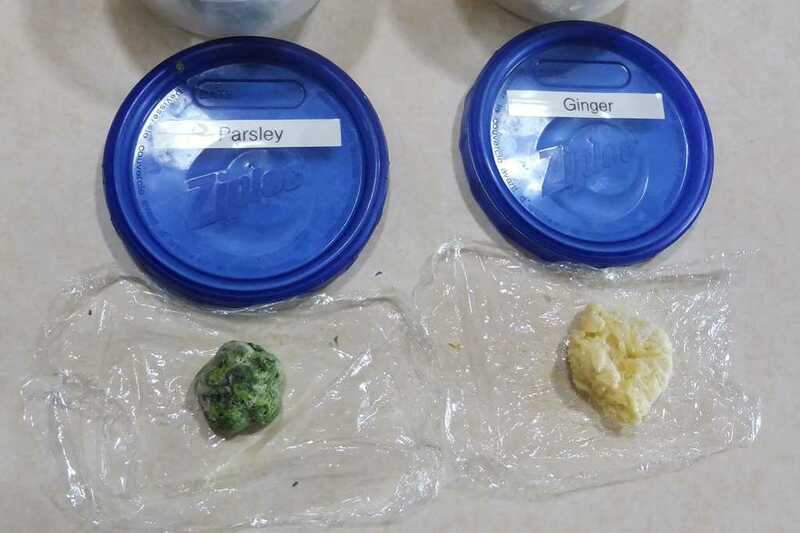 Non-plastic alternative: For those who prefer not to use wrappings around the herbs, the servings could be dropped onto waxed paper on a cookie sheet or on a plain cookie sheet and frozen as is. Once the herbs are frozen, peel the servings off the waxed paper or plain cookie sheet (this is much harder) and go to the next step. The downside of not wrapping the servings is a greater tendency for freezer burn and a tendency for the individual chunks to stick together and form a solid mass. 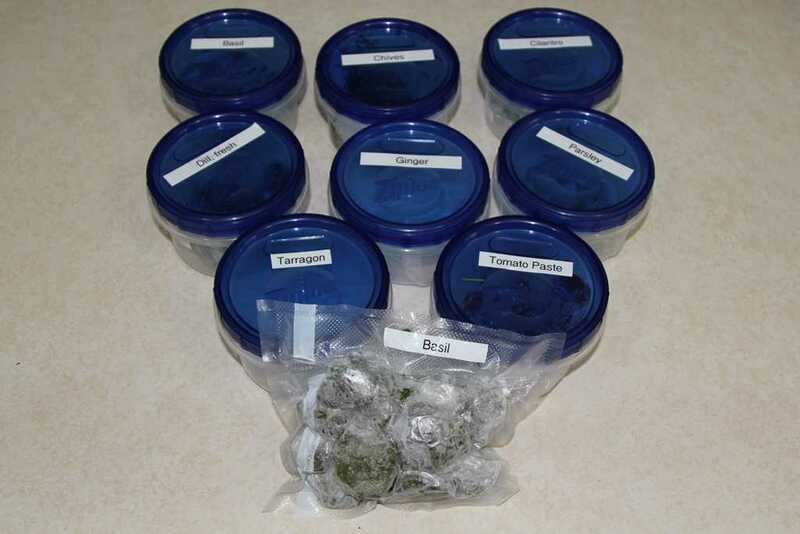 Frozen servings of herbs can be placed in any freezer safe container. Containers should be labeled. Note: Some herbs and spices are easily identified after freezing, but many green leafy herbs tend to look identical after freezing. So labeling is essential, unless flavoring surprises are preferred. 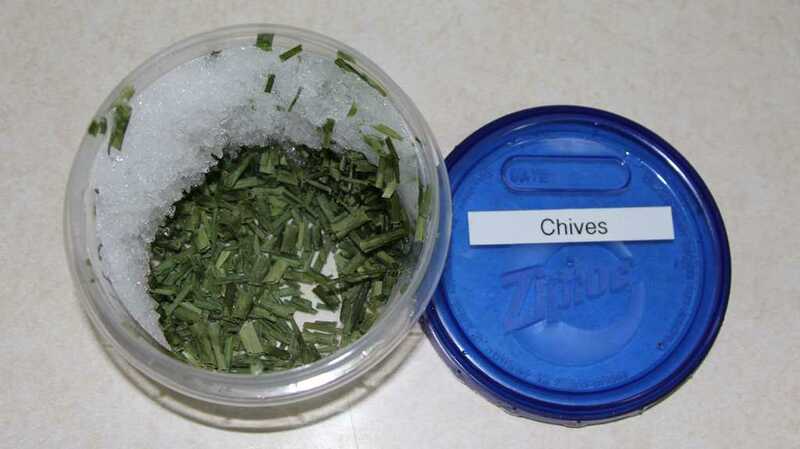 Frozen herbs and spices can be thawed and used in place of fresh herbs. Keep in mind that the frozen herbs contain oil. Another method that can be used is the “log” storage method. 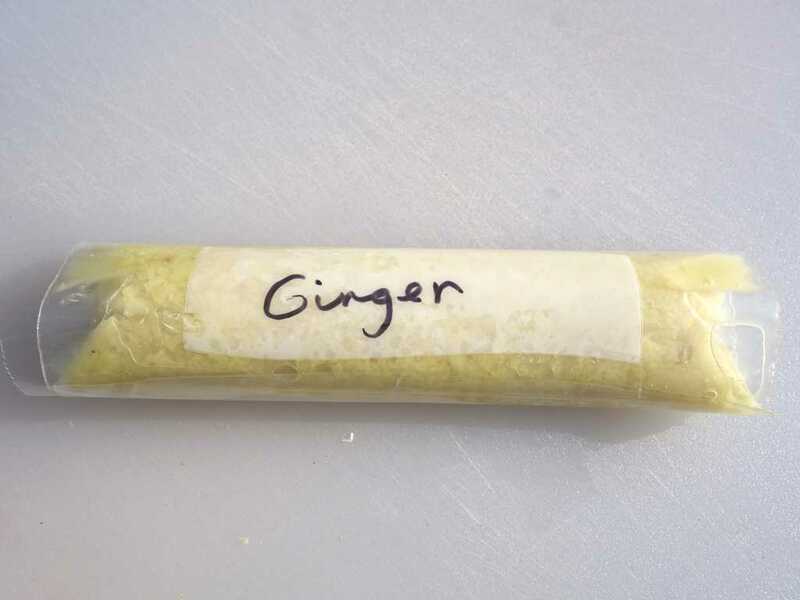 This works well for garlic, ginger, pesto and others. 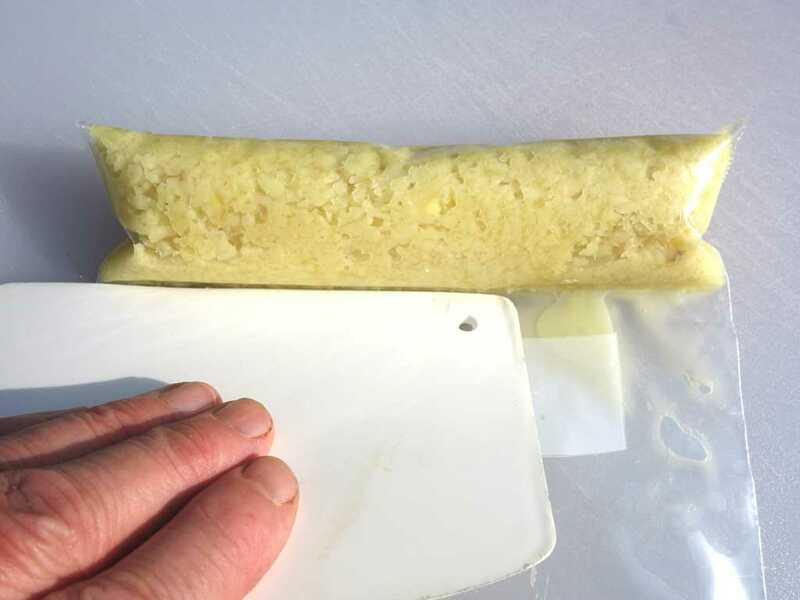 Place the ground mixture in the bottom of a plastic freezer bag and push it evenly into the bottom of the bag to form a uniform log about 1-inch in diameter. Cut the top of the bag and roll it around the log and seal securely with tape, label and freeze. Now, you can cut off as much as you need each time from the frozen log. To protect the cut end of the log from freezer burn, cover it with plastic wrap secured with a rubber band after each use.